When the Habs and the Leafs face off in an exhibition game, Freddy is beside himself with excitement. He has a secret mission to find Billy Binkle, the most famous hockey player of all time. Although Freddy''s dad gently suggests that Billy Binkle may not be at the game, Freddy is convinced. "He''s going to sign my stick, too!" he says. Is Billy Binkle really at the game? And will Freddy find him? 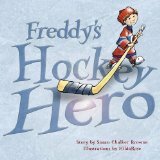 This fast-paced adventure (with a surprise ending) will have thousands of fans cheering for our Freddy. Susan Chalker Browne is an award-winning writer, journalist and teacher. Hey Freddy! It''s Canada''s Birthday is her eighth book for children. Her other books include Marconi''s Secret, The Amazing Adventures of Captain Bob Bartlett, At Ocean''s Edge, The Land of a Thousand Whales and her most recent, Freddy''s Day at the Races. Her books Thomas Doucet - Hero of Plaisance and Goodness Gracious, Gulliver Mulligan were each named Canadian Children''s Book Centre "Our Choice" selections.